Some used them as room dividers, also as burial mats…If somebody died they say they wrapped them up like a mummy, but they took all the insides out and studied them to figure out the cause of the death. Before they buried them they stuffed them with grass and moss and then wrapped them all up. Before they had cloth they used grass mats. The weaving of mats from wild rye grass was one of a woman’s constant tasks. Ivan Korovin wrote of the Unalaska people during 1763-65 that “they sleep upon thick mats, which they twist out of a kind of soft grass that grows upon the shore.” Finely woven mats made of split grass were used as kayak seats, sleeping blankets, and floor coverings. They were hung up as screens to mark off individual family areas inside the large communal houses. Mourners wrapped the dead in embroidered mats before placing them in the ground, tomb, or cave. Aron Crowell: How would you use a mat like this? Maria Turnpaugh: Well, some use them as room dividers, also as burial mats. (1) A story I heard from my dad is that Aleuts taught themselves how to cure. And if somebody died, they say they wrapped them up like a mummy, but they took all the insides out and studied their insides to figure out the cause of the death. And before they buried them, they stuffed them with grass and moss, then wrapped them all up. Before they had cloth they used grass mats. They talked a lot about burial grass mats. Daria Dirks: How would you say this in Aleut? Aron Crowell: Is that a different type of weaving? Mary Bourdukofsky: Like fish baskets [open weave]. Daria Dirks: This looks like a regular weave. Maria Turnpaugh: Yes, that’s a regular weave. You have to turn around and go back if you’re making something flat like this. Mary Bourdukofsky: They go back and forth. Maria Turnpaugh: And you just weave them straight. That’s actually very easy, and it’s much faster to weave like that. Mary Bourdukofsky: Mm-hmm, with the wide spaces. It’s a long ways. They probably got so far then hung it up, because it’d be hard to keep it up on your lap. Maria Turnpaugh: Or another way is to do so much and then roll it, then do so much and roll it. Mary Bourdukofsky: To me it looks like after they weaved it, they embroidered over it. Maria Turnpaugh: Well, if you do it the old-fashioned way, you would take your colored thread, wrap it around your weaver, and then weave it. And then the next one you just wrap it around again so your colors are on the top. That’s how Anfesia [Shapsnikoff] taught me to make flowers and stuff like that. 1. According to Mary Bourdukofsky and Vlass Shabolin, graves have been uncovered at construction sites on St. Paul Island and revealed bodies wrapped in grass mats. The description of mummification is from the discussion of armor A017249. See A017249 for a longer discussion of this practice. The processes of harvesting, processing, and weaving the grass for mats were much the same as for baskets, although long, tough grass harvested in late summer or even early winter was preferred for its durability. (7) Large, fine mats could take months or an entire year to complete, a task that sometimes fell to female slaves in pre-contact society. 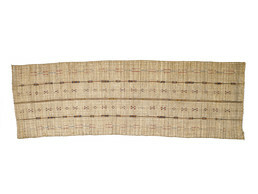 (8) Embroidery techniques, like the geometric designs worked in colored thread on this fine mat, were similar to those used on baskets.